The datapoints that suggest the market for new airplanes is underoing a severe repricing shock kept coming overnight, when just two days after Iran announced it had negotiated the "$16.6 billion" purchase of 50 737 planes and 30 777 aircraft at half the sticker price, and one year after we revealed that a used Boeing 777 can be purchased for as much as 97% off, overnight Delta Air Lines said that it would scrap an order for 18 787 Dreamliner aircraft, valued at more than $4 billion at list prices, which the company assumed as a part of its merger with Northwest Airlines. In its statement, Delta did not disclose specific terms of the agreement. “This business decision is consistent with Delta’s fleet strategy to prudently address our widebody aircraft needs,” Greg May, Delta’s senior vice president of supply chain management and fleet, said in the statement. Delta, which acquired Northwest in 2008 for $2.6 billion in shares, said it would continue to take delivery of 737-900ER aircraft through 2019. As Bloomberg notes, Delta’s decision was not completely unexpected . While some Northwest pilots held out the 787 as a “star,” known for its fuel efficiency and a body made of composite materials, some of Delta’s 777 aircraft had nearly the same capabilities, said Bob Mann, head of aviation consultant R.W. Mann & Co. in Port Washington, New York. Also, Delta tends to fly bigger planes on average than its peers, and the larger 777 is more consistent with that strategy than the 777, Mann said. “I wasn’t surprised, but I was surprised they took 10 years to do it,” Mann said of the cancellations. The disappointing news came just two weeks after Boeing said it doesn’t have enough orders to maintain the current 777 widebody jet-program production rate of seven planes per month and would cut production in Everett to five per month beginning in August. During an earnings teleconference in October, Boeing Chairman and CEO Dennis Muilenburg had projected that outcome if further sales failed to materialize within a couple of months. Zero 777 sales have been booked since. Boeing's outlook was worse than the above figures indicate. In 2018, 777 deliveries would drop further to just 3.5 jets per month, as Boeing introduces blank positions in the assembly line before and after each of the first six 777X models it builds, to allow extra time for assembly of that new airplane. It's not just Boeing however. Yesterday Europe's Airbus for the second time in 2016 announced it was cutting production plans for its flagship A380 superjumbo and now faces the prospect of losing money on the plane again already next year. Airbus in July had to concede the outlook for the A380 was darkening when it cut production plans to just 12 A380s planes a year starting in 2018, down from the 27 it built last year. It had planned to build around 20 of them next year, reaching break-even on those deliveries. But Airbus Tuesday said it had to cut further. After a three-way agreement involving also Emirates Airline, the biggest buyer of A380s, and engine maker Rolls-Royce Holdings PLC, the plane maker will delay six A380 deliveries planned for next year to 2018 and another six from 2018 to 2019. Airbus wouldn’t detail the reason for the schedule change. The move comes at a time both the European plane maker and its larger rival Boeing Co. face the prospect the era of the big, four-engine long-haul plane is ending. Airbus has struggled to win orders for the A380 and Boeing has had to cut production plans for its 747-8 jumbo jet owing to slack demand. In this context, Delta's cancellation comes the company and other top U.S. airlines seek to slow flight capacity growth and in some instances shrink existing service in response to falling airfares. As Reuters adds, airlines like Norwegian Air Shuttle from outside the United States are adding flights that Delta says have exceeded passenger demand and hurt unit revenue. Delta has 25 widebody aircraft from Airbus Group SE (AIR.PA), the A350, already slated for delivery that will add to its flight capacity this decade. Delta said earlier this year that it would defer the delivery of four A350s by a year or two from 2018 to make the schedule "more consistent with (the) expected pace of international market improvement." The problem, John, as the last recession showed, is that all those orders quickly turn to cancelations once economic conditions turns, which they now appear to be doing. Airbus Group SE’s struggles with its A380 superjumbo are deepening as the planemaker delays deliveries of a dozen aircraft over the next two years to Emirates, the double-decker’s biggest buyer, potentially pushing the program into the red. Handovers of six A380s apiece originally planned for 2017 and 2018 will be shifted to a year later following an agreement between Emirates and engine supplier Rolls-Royce Holdings Plc, Airbus said Tuesday in an e-mailed statement. The planemaker will accelerate cost cuts at the A380 operation to ensure that the “impact on break even in 2017 is minimal.” Airbus said it still plans to keep to a reduced delivery target of about 12 A380s a year as of 2018. Airbus scaled back its annual production schedule for the A380 in July after failing to secure new orders this year, and it outlined a round of spending reductions aimed at matching revenue and costs for the model in 2017 with 20 scheduled deliveries. The program broke even in 2015 at 27 deliveries. A spokesman declined to comment Wednesday on projected handovers for next year. Emirates and Rolls-Royce reached a settlement in early December over concerns about A380 engine performance and maintenance needs that the airline disclosed the previous month. The delays have compounded Airbus’s efforts to turn around the fortunes of the A380, the world’s largest commercial jetliner, which lists for $433 million before the discounts customary in the industry. Airbus fell 0.3 percent to 62.72 euros at the close Wednesday in Paris. That pared the stock’s gain this year to 1.2 percent, valuing the Toulouse, France-based manufacturer at 48.5 billion euros ($50.4 billion). Rolls-Royce rose 0.9 percent in London to 686.5 pence, for a market value of 12.6 billion pounds ($15.4 billion). State-owned Emirates isn’t traded. The delays cap a tough year for Airbus’s flagship model. Most recently, an order for the A380 from Iran didn’t materialize when that country announced purchases from Airbus in mid-December. U.S. competitor Boeing Co. is also having trouble selling its competing 747-8. Emirates is by far the biggest buyer and operator of the A380, with orders for more than 140 planes configured for 489 to 615 seats. The carrier, also the world’s largest long-haul airlines, is set to take delivery of its first Rolls-Royce-powered version of the jetliner on Wednesday, almost four weeks later than planned. A further two aircraft will be delivered this week, a spokeswoman for Emirates said by e-mail. The carrier will continue to take delivery of A380s as well as Boeing 777s in 2017 and 2018, she said, declining to provide a breakdown. The Dubai-based carrier switched to Rolls-Royce engines for its latest batch of A380s after relying on General Electric Co.’s Engine Alliance joint venture with Pratt & Whitney for its first 90 orders, the last of which will be delivered early next year. Winning Emirates as a customer for its Trent 900 engine was a major commercial victory for Rolls-Royce when it was announced in 2015. The contract for 217 powerplants -- sufficient to power 50 four-engine planes, plus spares -- remains the largest in the history of the U.K.’s prime manufacturer. In November, Emirates President Tim Clark revealed that feedback on the powerplants indicated “technical issues” that needed to be resolved before the first plane would be handed over. Clark said the engines required a “higher intervention rate” than expected for maintenance, in part due to unanticipated levels of wear to fan blades stemming from their deployment in Dubai’s desert climate. Rolls-Royce will take the full financial brunt of the extra costs, he said in December. 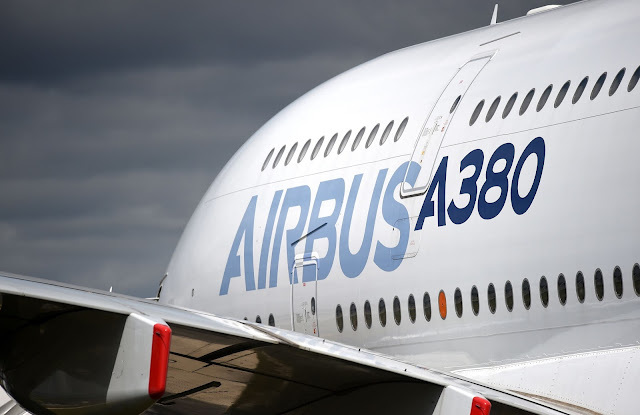 LONDON— Airbus Group SE for the second time this year is cutting production plans for its flagship A380 superjumbo and now faces the prospect of losing money on the plane again already next year. Airbus in July had to concede the outlook for the A380 was darkening when it cut production plans to just 12 A380s planes a year starting in 2018, down from the 27 it built last year. It had planned to build around 20 of them next year, reaching break-even on those deliveries. But Airbus Tuesday said it had to cut further. After a three-way agreement involving also Emirates Airline, the biggest buyer of A380s, and engine maker Rolls-Royce Holdings PLC, the plane maker will delay six A380 deliveries planned for next year to 2018 and another six from 2018 to 2019. Airbus wouldn’t detail the reason for the schedule change. Deliveries of the first Rolls-Royce-powered A380s to Emirates Airline have been slightly delayed amid concerns by the carrier about technical issues with the engine, though the airline’s president Tim Clark this month said those had been resolved. On Tuesday, state-owned Emirates Airline said it expected to receive its first A380 powered by Rolls-Royce engines this week and a further two by the end of the month. The Dubai-based airline, the world’s biggest by international traffic, currently operates all its A380s with engines made by a joint venture of General Electric Co. and United Technologies Corp.
Rolls-Royce said it was working with Airbus and Emirates Airline to meet their requirements. But for Airbus, the latest schedule change represents another headwind for the A380. The double-decker A380 that seats on average 544 passengers is Airbus’s most iconic plane, but the Toulouse, France-based company has struggled to secure orders for the jet. Airlines are worried they will struggle to fill all those seats on a plane that costs $432.6 million at list price, though buyers get often big discounts. Development and production delays have made the plane a financial headache for the company. Airbus only last year began delivering A380s that no longer lost money, eight years after the first was shipped. Airbus said it would accelerate efforts to minimize the financial hit, though signaled the program would fall back into the red already next year. It had previously forecast it could remain at break-even in 2017, before falling back into the red in 2018. “The impact on break-even in 2017 is minimal,” the company said. Cutting 2017 delivery plans is only the latest in a string of setbacks for Airbus on the A380 in 2016. Earlier this year Airbus said French carrier Air Austral had canceled an order for two of the planes. Air France-KLM SA this year also said it had dropped plans to take the last two A380s it had ordered. Malaysia Airlines, which owns six of the planes, plans to stop using them in about two years. And Qantas Airways Ltd., which flies the plane, has said it doesn’t want any more. Singapore Airlines Ltd. .—the aircraft’s first buyer and currently its second-largest customer—in September said it won’t renew the lease for its first plane and maybe more. Iran Air in January also signaled interest in buying 12 A380s as part of a mega-order with Airbus. But when the state-owned carrier and Airbus last week announced their 100 plane deal valued at more than $18 billion at list price, it no longer included A380 planes. Airline officials have indicated other planes Iran Air was buying would suffice. Iran Air also took a pass on buying Boeing’s 747-8 jumbo jet, instead opting for the new 777X twin-engine long-range plane that can seat more than 400 passengers and is due to enter service around the turn of the decade. Airbus executives have said they remain optimistic of winning new customers for the A380 and that production would eventually increase beyond one-plane a month. For Emirates Airline, the delay in introducing additional A380s comes as the airline is dealing with the slump in premium demand because of the sharp fall in oil and gas prices. Ticket prices have fallen sharply. Mr. Clark this month said he was delaying a decision on ordering additional long-range jets in part because of concerns about tepid traffic growth in the coming years. The airline wouldn’t comment on plane delivery plans, beyond saying it would continue to introduce new A380s and Boeing 777 widebodies in 2017 and 2018. 0 Response to "Delta Scraps $4 Billion Order For 18 Boeing 787 Dreamliners As Airbus Cuts A380 Production"